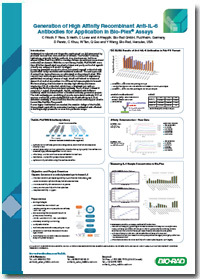 This poster describes a project using the HuCAL® antibody library and phage display technology to develop an anti-human interleukin-6 (IL-6) antibody for use in a sandwich ELISA pair with an existing Bio-Rad mouse monoclonal anti-IL-6 antibody. The level of IL-6 in blood is very low (~1 pg/ml), therefore the desired outcome was a high affinity antibody to enable development of a very sensitive assay. Selection of antibodies using HuCAL technology is performed entirely in vitro, which enables greater flexibility for antibody generation than is possible with traditional methods based on the immunization of animals. Two guided selection strategies were used to identify the best antibodies for the ELISA pair. The best antibody pair was successfully tested in a Bio-Plex sandwich assay using recombinant human IL-6 as standard. The Bio-Plex multiplex system enables the detection and quantification of multiple analytes in a single sample volume; the system uses xMAP technology licensed from Luminex.